Every year I set a goal to become more productive, which for me usually means looking over my current task management system, observing what I’m doing well and what I need to improve. Typically the time for this evaluation is the end of one year and the start of the next, though I’ll sometimes do this in between large projects when I need to refocus myself. Now is one of those times. Last week I talked about the importance of focus and I mentioned that I would continue and talk about the productivity system I use. Over the next few weeks, I’ll also talk about where productivity systems sometimes fail when it comes to creative work and how I manage to make the two work together for me. Over the years I’ve tried several methods to organize my work and remind myself what I need to do. At first it was a simple list of things I thought I’d forget. Unfortunately that doesn’t scale well and sadly it didn’t always work to get me to do what was on the list either. 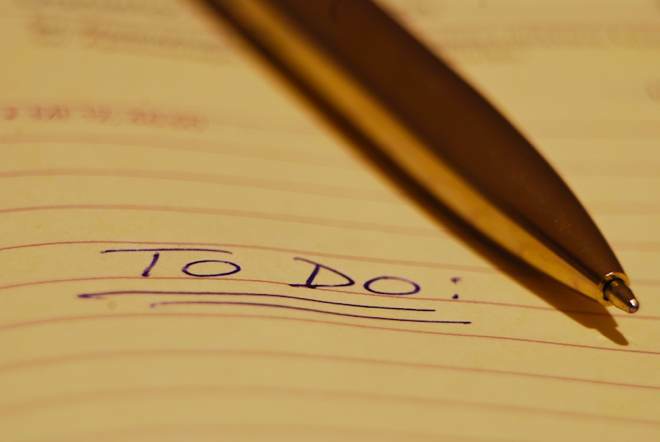 GTD can help you determine what to do next at any point in time, but you still have to do it. I read a handful of productivity books, though none seemed to work for me. For a time I tried scheduling a calendar each week, which helped to a degree, but as most of my work isn’t time sensitive, I found myself spending too much time rearranging unfinished items on my calendar. It was a lot of guessing what I would do on a given day only to have reschedule things again and again. Eventually I read David Allen’s book, Getting Things Done. It’s not a perfect system for me, which I’ll explain later, but I do like the logic behind the system. It made sense to me. If you’re looking to implement a system I recommend giving the book a read. Even if you decide not to use GTD, I think you’ll find something in the book to help make you more productive. The rest of this post is an overview of GTD, but again I’d recommend reading the book to understand how to use the system. It takes a lot of mental energy to try to remember everything you have to do. Every task undone is an open loop. By getting things out of your head and into a trusted system you close these loops and can focus more on the things you have to do. Doing work as it shows up—When you have or want to do something right away. Doing predefined work—Choosing what to work on next based on your system. Defining your work—The process of entering everything into your system. Productivity systems focus on the latter two activities. Each teaches how to enter to do items into the system and then find them later so you can do the work. GTD has a four step process to get things out of your head and into a system you can trust to not let you forget. Naturally somewhere in this process is the actual doing of tasks. It wouldn’t be much of a productivity system if you never did anything. The steps above are to help you determine what to do next at any point in time, but you still have to do it. No productivity system does the work for you. Collect—This step is to get everything out of your head and store it all in one location for processing. You can collect ideas, questions, reference material, emails, etc. You might initially collect these things in different buckets, but they should all funnel into one central location for processing. Process—This step is to decide what to do with all the things you’ve collected. GTD provides a workflow flowchart (PDF) to follow. First you ask yourself a couple of questions about the item you’re processing. If it’s not actionable then trash it, save it for someday, or save it as reference material. Eliminate, incubate, or file. If it is actionable you want to turn it into a task or a project. If it’ll take less than a couple of minutes just do it. For projects you’ll do some planning, which involves creating as many actionable tasks as needed to complete the project. At the single task level you decide if the task is for you or someone else. If it’s for someone make sure they know and then let them do the work. If it’s for you it needs to be organized into your system. Organize—There are a number of decisions to make when organizing tasks. Is a to do item part of an existing project or is it a one off task? If it’s a project where does the task belong. Is it something that can only be done before or after another task (series) or can it be done at any time (parallel). Is it time sensitive? Does it need to be finished or started by a specific date? If so it should be added to your calendar, but only time sensitive tasks should ever appear on your calendar. There are also a handful of criteria you’ll associate with each task and project. I’ll get to these in the next section. Review—At regular intervals you want to review what you have in your system. It could be a quick daily review to process your in-basket. It could be a weekly review that helps you see what you’ve done and reorganize what’s left to do. It could also be a monthly or semi-annual review that considers your tasks and projects from a higher view. A daily review might only look at current actions and projects. A weekly review will include areas of responsibility (For me that’s mainly my clients, including myself) The monthly or semi-annual review will look at short and long term goals. You decide what to work on next based on four criteria, which act as constraints to filter your tasks and present only those that are possible options for what you can work on next. Context—Some tasks require a physical location to complete. Errands for example. Some might require a phone or the internet. Unless your context, your current situation and available tools match what’s required for a task, it doesn’t make sense to see that task as something to do. Time available—If you only have 15 minutes free before a meeting then you only need to be presented with tasks you can complete in 15 minutes or less. Energy available—Your mental energy for work varies. You might not be up for a task before you’ve had your morning coffee or maybe you find yourself low on energy after lunch. Priority—Some tasks and projects are more important to complete than others. When processing tasks you would add the above criteria to each task as you organize them into projects or single to do items. One task might require a code editor, a half hour of time, and a medium amount of mental energy. Another might only require a browser, 15 minutes to complete, and little energy. When Tuesday afternoon rolls around and you’re feeling low on energy, but want to be productive with the last couple of hours of the day, you can call up your tasks that don’t require much energy and can be completed within a two-hour time span. You can pick from those items based on their priority and what you’re capable of doing with the tools at hand. That’s an admittedly quick overview of GTD. You want to get stuff out of your head so you can close open loops. You get them out of your head by adding them to a trusted system of collect, process, organize, and review. There are more details for how to organize your tasks beyond setting them in series or parallel, placing them in projects, and adding different criteria to them, but hopefully you get the general idea. From the moment I started using the system. I’ve been able to better determine what to work on and when, which ultimately helps me get more done. It takes some time to get used to the system and practice using it, which is why daily, weekly, and monthly reviews are so important. It’s also why I reevaluate my use of the system every year and make changes to improve it. There’s one downside I’ve found to the system and that’s getting it to play nice with creative work or any work that is difficult to break down into well-defined tasks. That’s something I’ll talk about next week.